The annual Building Awards in Copenhagen were established in 1902 but it was only last year that citizens were asked to vote for a public award for one of the buildings on the list of finalists. Last year the building selected for that first public award was Axeltorv / Axel Towers by Lundgaard & Tranberg Arkitekter. The winner this year is interesting. From a diverse list of unusual and quite adventurous building projects around the city, the public selected an apartment with a high-rise tower out of the city, just under 5 kilometres from city hall, out to the south west beyond Vestre Kirkegård … the western cemetery. This is Amaryllis Hus on Paradisæblevej - designed by Mangor & Nagel and part of a major redevelopment of Grønttorvet - the old wholesale vegetable market - a short walk from Ny Ellebjerg station. Work is moving forward fast on the hard landscaping at street level above the new metro station at Gammel Strand … a station on the new circle line that will open later in the summer. The steps down to the platforms and the glass covered lift tower are in place and setts are now being laid in the traditional scallop pattern across the main area so the new arrangement for this important historic street is becoming clear. There was consultation with local businesses and local residents. Vehicles will be excluded, apart from deliveries, so the only through traffic will be a new narrow bike lane but with markings showing lanes to cycle in both directions. The existing road, now being removed, runs parallel to the building frontages with just a narrow pavement so with little space for outside tables and chairs for the restaurants here. With the bike lane set forward closer to and parallel to the canal there should be much more space for people to sit outside and the gentle curve of the bike lane takes that bike traffic along the side of the canal further west rather than running as the road does now through in a straight line to Snaregade. 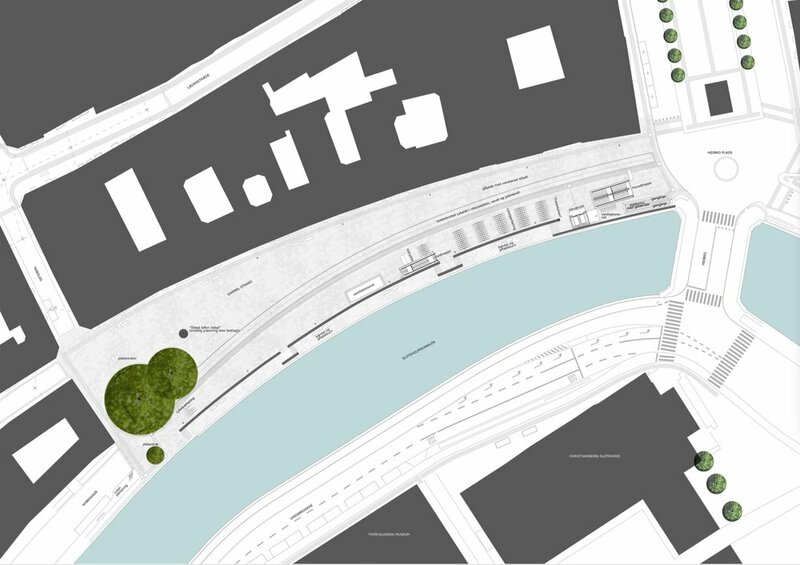 There will be steps down from the street level of Gammel Strand to a lower canal-side level for access to boats but as a sun trap it will certainly be used by people simply wanting to sit and watch what is happening on the water. 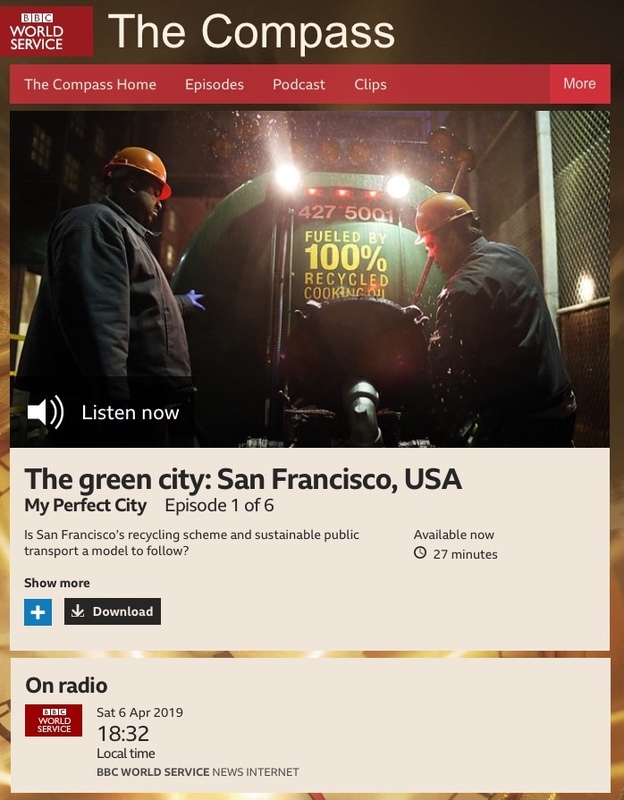 Last week I posted about an interesting new radio programme on BBC World Service that is looking at which features of our cities now might together make a perfect city for the future. The second programme was broadcast today and examined how cities use smart data looked specifically at Seoul in South Korea. Interesting ideas were discussed but the overriding message must surely be that citizens right now should be discussing what data should be collected, how it should be used and who has access to that data. Passively waiting to see what governments or global companies do and then complaining is not the best approach. The four sections of the new cycle and pedestrian bridge have arrived from the Netherlands on a gigantic barge and are being lifted into place … the work started yesterday and it looks as if all the sections will be in place today. These photographs show what will be the first fixed section from the city side as it was taken off the barge by a huge floating crane and swung across the harbour and lowered into place to be guided down by engineers on the quayside by BLOX and engineers in two small boats by the pier in the harbour. The sections in place, in the photographs, are the first section from the Amager side and the part that swings open on the the city side - general views are photographed here from Langebro. The bridge will be completed by late summer and then the opening and closing of the swing sections will be controlled from the bridge house on the existing road bridge. A bright if slightly cold Sunday afternoon so it seemed like a good time to walk over to the south campus of the University of Copenhagen to look at progress on the new landscaping for Karen Blixens Plads by COBE. The main construction work is finished and the paving done but the area is still fenced off although it might be the best time to take photographs before it gets swamped with bikes and students. This report from the engineering consultants ARUP sets out many of the important principles that now guide planning policies for the city of Copenhagen. It has a short introduction by Frank Jensen - the major of Copenhagen - where he writes about the efficient use of limited resources and concludes that "It was thought that environmentally friendly development would limit economic growth. However, quite the reverse turns out to be true. Green growth can, indeed, boost economic development and the quality of life .… the business of introducing sustainability into the city poses very different issues than affecting it in the country as a whole … and require city specific solutions." The report sets out the problems and some of the solutions that the city has adopted - often through the use of innovative technology - and the achievements, in terms of environmental gains, along with lessons to be learnt. There are good, clear graphics, a lot of information and interesting details about projects under eight main sections. Headings for those sections of the report give a good indication of priorities for the city, in terms of sustainability, both now and for the future …. By coincidence - in the middle of a series of posts about housing schemes that are classified as vulnerable with what are now defined by the Danish government as parallel communities - the most recent newsletter from Realdania to arrive in my inbox is about a new research project funded by them and to be undertaken by the Aarhus School of Architecture to map out and assess buildings in these vulnerable neighbourhoods. The report will include a valuation of the heritage and cultural value of these buildings and will be completed in May and then submitted to housing organisations and municipalities. For readers who are not Danish and might not have heard of the them, Realdania is a major philanthropic association that was established in 2000 and is now involved at all levels with the built environment by undertaking research, providing subsidies and grants for restoration or improvement of historic buildings of all types or by supporting major new building projects. They have also acquired important historic buildings of all periods which Realdania have restored and given to public bodies or restored and then let to appropriate tenants but usually with some access for the public. They now have a strong catalogue of publications and they send out the regular newsletter with information about their projects or about exhibitions where they are involved or with information about their new publications. Many of their assessments, and their technical reports and guides to historic buildings and monuments can be read on line. Tingbjerg housing scheme was designed by the Danish teacher, writer and architect Steen Eiler Rasmussen and the landscape was designed by C Th Sørensen. Building work started in 1956 and was completed in 1971 and by then there were 3,000 homes here with most in apartments in blocks that are three storeys high - over half basements containing service rooms - although there is also one tower block and a line of single-storey homes along the west edge of the scheme. Tingbjerg is out to the north west of the city centre, on relatively high land, close to the moor and lakes of Utterslev, and around 7 kilometres from the city hall. It was planned as a small, self-contained town with shops, a school and a church and at one stage 10,000 people lived here although the number is now below 7,000. There are long rows of apartments that are set in a regular grid of roads with a main peripheral road and one main cross street running east to west although most of the apartment blocks are set north to south so that they make the most of morning and evening light. Buildings are laid out around generous squares and large open spaces with a good planting of trees that are now mature and there are a number of areas where children can play. There is also access to what is still and certainly what was in the 1950s areas of open countryside and the high elevation, or at least high for Copenhagen, means that there are views back over the city. Even today, the light seems clearer and the air fresher up here than down in the city and, back in the 1950s, that contrast must have been more marked when there was much more air pollution. Families moving here then must have been positive about being able to move out to a new home in a new suburb. The site slopes and the rows of apartments are staggered - rather than being in long straight unbroken lines - and the topography has been exploited with terraces and short flights of steps at changes of level that again softens and breaks up the impact of building even though so many homes were built in a single phase and in what is, in essence, a single style. Constructed in light-coloured brick with dark roofs, workmanship is of a high quality and the design of the buildings is simple but not stark so the style is clean and actually quite elegant. A distinct feature is slatted shutters that slide back from the windows on some buildings. Tingbjerg is a good example of classic Danish design at its best. This was recognised in 1959 when the first phase of the scheme received the Bygningspræmiering / Building Award for New Residential Property. Given the high quality of the design and the construction of the scheme, it is ironic that in the recent government report - Ét Danmark uden parallelsamfund / One Denmark without a parallel society - Tingbjerg is now designated as one of 16 ghettoes in Denmark where serious social problems have been identified and there is now funding with recommendations for intervention. These photographs were taken in January 2019. “One must set oneself the goal of creating a human environment that can enable each occupant to unfold in the most harmonious and rich way." This report from Arup Smart Cities was commissioned by the Danish Ministry of Foreign Affairs and was published in 2016. It makes important points that should be considered alongside a recent report on updating the Finger Plan and a major report on an initiative for the development of the Copenhagen region. Planning for future urban growth has to factor in new technology and the role of smart data. Growing Smart Cities gives a brief overview of the approach to digital and smart technologies in the Danish cities of Copenhagen, Aarhus, Vejle, and Albertslund and, for context, brief assessments of developments in smart technologies in other countries. The report identifies a growing number of companies undertaking research and developing projects but one aim of this report is to find ways for these to be scaled up and to find ways to ensure that they are carried forward. The approach is two-fold, looking first at growing smart Cities in Denmark - so at digital technology for urban improvement and mentions several times the word liveability - but, for obvious reasons, looks at the financial and investment potential of developing these new technologies in Denmark. There is encouragement for education to address a potential shortage of people with appropriate digital skills with a need to teach a new generation of students who will be qualified when research departments scale up projects - to take them forward - and to work with business who now have to assess long-term returns from what is often considerable investment. The conclusion is that "Denmark has an opportunity to become a world leader in smart cities." In the introduction to this edition, Jan Gehl explains that Life Between Buildings was published in the 1970s to point out "the shortcomings of the functionalistic architecture and city planning that dominated the period." "The book asked for concern for the people who were to move about in the spaces between the buildings, it urged for an understanding for the subtle qualities, which throughout the history of human settlements, had been related to the meetings of people in the public spaces, and had pointed to the life between buildings as a dimension of architecture, urban design and city planning to be carefully treated." Although the first edition was published over 30 years ago, walking around recent developments on Amager and in the South Harbour area and certainly when walking around the redevelopment of the Carlsberg site, it appears that, even now, too often, the observations set out by Jan Gehl have been forgotten or ignored. There are seats and there is planting but too often these seem to be a token scattering of street furniture rather than reflecting a coherent approach for these areas. If you don’t know Copenhagen well, or if you have not come across the work of Jan Gehl and his approach to planning in the city, then a good place to start is with How to Build a Good City - an interview with Gehl that was posted last year on Louisiana Channel. I have been meaning for some time to post a link here to Louisiana Channel. This is an important and fascinating series of on-line films and long interviews from Louisiana Museum of Modern Art and although, as you would expect, many of the interviews relate directly to exhibitions at the museum or to the works of artists in their collection, the films range widely in their subjects and locations … there are interviews with leading architects and designers, including several with Bjarke Ingels, a series of interviews about the work of Jørn Uttzon and an interview, posted recently, is with Kim Herforth Nielsen of the architectural practice 3XN about their designs for the new Fish Market in Sydney. The Danish Navy maintain an important though reduced presence in Copenhagen - with the main naval bases for the country now in Frederikshaven and Korsør - but there are plans for much that is still here to be moved away from the city and recently there have been discussions to decide on the most appropriate use for the historic naval buildings on Nyholm. This is an important part of the harbour and not simply because Nyholm is prominent on the east side of the entrance to the historic inner harbour but also because the island has an important and symbolic place in the history of the city. On the emplacement at the north end of the islands are guns for official salutes to mark royal and national occasions and the flag flown here has huge significance. When the royal yacht returns to Copenhagen, it is moored immediately north of Nyholm. There are important historic buildings here including two of the most extraordinary buildings in the city … the Mast Crane that is an amazing example of maritime engineering and the Hovedvagt or Main Guard House with a feature on the roof that looks like a giant chess piece. Both date from the middle of the 18th century and both are by the important architect Philip de Lange. photograph taken from the harbour ferry as it pulled in at the landing stage just below Skuespilhuset - the National Theatre. Tracking back a reference to the work by Tredje Natur on climate paving I came across Bright Blue Visions - an article they posted in 2013 with proposals for development of the harbour with new islands for sport and for a nature reserve for nesting birds as well as a park adjoining the Opera House that could be used for outdoor performances and a centre in the basin at Kroyers Plads to promote Danish advances in water technology. Their important argument was that the harbour is a common resource. My main reservation is that, although the harbour is a major resource and there has been a long tradition of the city claiming new land from the sea, the harbour is also a phenomenal asset as a major and impressive open space where sports and events and recreational boating and swimming can all be staged but without substantial and long-term structures. As with the new bridges over the harbour, what is undermined is the sense of space - a threatened asset in any city - and a feeling that the harbour - after all still open to the sea - could become domesticated or tamed and contained and divided up - so little more than a larger version of the lakes across the north side of the inner city. Included by ministers in the launch in January of their 52 point Capital Initiative was a major project for a large, new island to be constructed across the entrance to the harbour. Work could start in 2035. Under a heading Room for Everyone it was, in fact, the first point of the 52 - but already the proposal seems to have generated a fair amount of criticism. The island, to be called Lynetteholmen, could have housing for at least 35,000 people and eventually work for as many and would include coastal protection measures to stop surges of storm water entering the inner harbour but it would have a fundamental impact on the character of the inner harbour by closing off views out to the sound and would restrict the routes of access into the harbour for large and small vessels. Although the new cruise ship terminal at Nordhavn is outside the proposed island, the drawing shows further quays for large ships on the seaward side of the new island so it is not clear if these would replace the present berths for cruise ships along Langelinie Kaj. Politiken published an article on the 3 March with comments from a workshops with architects and engineers and planners where it was suggested that the island, as shown in the drawing first presented by the Prime Minister in October, is too close to the Trekroner fortress and is too large with several critics suggesting that it should be broken down into a series of smaller islands. No further decisions can be made until tests of the sea bed are completed and until related projects are confirmed including the plan for a major road link across the east side of the city that would have to cross the harbour and the proposal for an extension of the metro through a tunnel between Refshaleøen and Nordhavn. Apparently the main sections for the new cycle and pedestrian bridge across the harbour will arrive in April. These have been manufactured in The Netherlands but delivery was delayed when a section was damaged beyond simple repair in an accident last summer as it was being loaded onto a barge to move it to Copenhagen. The new bridge - Lille Langebro or Little Langebro Bridge - will cross from Langebrogadegade on the Christianshavn side of the harbour to Christians Brygge, immediately south of BLOX on the city side. It makes every sense in terms of planning and will provide an important and safe new route for cyclists riding between Amager and the city which means that they will not, as now, have to go up and across the main bridge. On the city side there are traffic lights for crossing Christians Brygge and the bridge lines up with Vester Voldgade which runs up to the square in front of city hall and the new metro station there and should keep thousands of cyclists each day clear of HC Andersens Boulevard which is probably the road in the city with the heaviest road traffic so this is all good joined up planning. But there is a part of me that regrets or do I mean mourns a further bit of chopping up the harbour … taming it …. domesticating it … making it look more and more like a river and less and less like one of the great and possibly the greatest ports of the Baltic. This photograph was taken a few weeks ago and soon this view will be lost … or maybe I just mean different and maybe it’s simply indicating that I’ve lived in the city for long enough to be rattled by change. On 15 February a new exhibition opened in the gallery space on the staircase at the Danish Architecture Centre. Communities Between the Walls is a counterpoint to the recent reports on social housing and ghettoes. Here are a number of major art projects that have been initiated in areas of deprived or poor housing in urban areas including the new library recently completed in the Tingbjerg housing scheme and the major projects in Gellerupparken in Aarhus. Bjarke Ingels submitted proposals for a large new building at the outer end of Orientkaj in Nordhavn that would have dominated the entrance to the inner harbour. This was to be a new headquarters for his architecture company BIG but the application was submitted anonymously - without the name of the architect or of the occupant - and it has just been rejected. This would be a very substantial building with eight floors but with a large square footprint that gives it rather squat proportions and the building was to be in concrete and, unfortunately, even good drawings submitted for the application still managed to make it look brutal. Unfortunate because, as Ingels himself explained in a subsequent statement, he was attempting to use concrete in a more honest way. I have written here in many posts about the new buildings going up so quickly across the South Harbour or on the new Carlsberg development and here at Nordhavn and they go up so quickly simply because they are built with pre-formed slabs of concrete for floors and walls but the outside is then disguised by a veneer of facing materials that are, in most cases, unrelated to the form of building and the logic of the structure underneath. In strict architectural terms they are dishonest. The drawings of the building proposed by Bjarke Ingels show that it would be very large and it certainly dwarfs the large warehouses that are to the west of the site on the same quay but the proportions are actually good and the series of ramps or diagonal lines respecting a complex arrangement of external and internal staircases is clever, giving the facades a regular spiral that is an echo of the design by Ingels for Søfart - his brilliant design for the maritime museum at Helsingør - but here rising up rather than there spiralling down. Concrete done badly for cheap and quick building can be horrendous but it can also be a material of real quality when used well and, although the building here would have been large, and dominate Orientkaj, it would, at least, have returned the harbour front to something closer to the bold forms that are a strong part of the recent development of Langelinie Kaj on the seaward side of the former Free Port and those buildings echo the scale and simple forms of the large historic warehouses of the inner harbour. Published on 24 January 2019, this is the next stage of that report and there will now be a period for public consultation through to 21 March 2019. The Finger Plan from 1947 was a key planning report that set the course and controlled the form and the extent of development out from the city through the second half of the 20th century and its influence has continued into this century so it has had a huge impact on the city for more than 70 years. That plan, to control development, was based primarily on existing lines of the suburban railway that radiate out from the centre of the historic city and new development has been centred on railway stations but with a web of green open space between the fingers … protected countryside that has been crucial as space for nature and for recreation that has stopped the expansion of the city from becoming a solid urban block like London or becoming a sprawl of unregulated development. The new plan is setting out how to allow for but control further expansion of the city and the region through to 2030 and beyond and it will focus on problems caused by climate change that makes green space and the control of surface water and flooding from the sea increasingly more important. Protection of green land is seen now to be a balancing act and new proposals will be controversial as some green areas could be lost - for instance where they are compromised by being close to major transport links - but there appears to be a commitment to add new areas of protected green space and particularly where this has a clear role in enhancing recreational use. In 1947, the original Finger Plan, set out the principle that development should be along the suburban rail lines with large buildings, such as city halls and shopping centres, close to the railway stations but the new plan will give the municipalities more freedom to plan for larger commercial buildings with some users up to 1000 meters from the stations in the towns of Helsingør, Hillerød, Frederikssund, Roskilde, Køge and Høje-Taastrup. Three special areas are designated in Nærum, Kvistgård and Vallensbæk, where it will be possible to plan for larger commercial buildings with many users. Planners and politicians want to strengthen secondary retail development in the metropolitan area with enhanced areas for local retail in Hillerød, Ishøj, Lyngby and Ballerup along with development in Helsingør and a new town center in Kokkedal. The report includes proposals for major developments on new land that will be claimed from the sea with Lynette Holmen, a new artificial or man-made island across the entrance to the harbour - where there will be housing for 35,000 but also the island will be part of major coastal defences to protect the inner city from flooding if there are storm surges in the sound. South of the city, Avedøre Holme will be a group of new islands that will be, primarily, for major industrial development. It has been suggested that these developments will bring 42,000 new jobs to the city. Under consideration is a section of new motorway around the city with the construction of what is called Ring 5 north from Køge, to follow a route between Copenhagen and Roskilde. Presumably, this is connected to assumptions that new traffic will be generated when the road and rail tunnel between Germany and Denmark is built. That international link was given final approval by the German region in December and could be open by 2035. An outer motorway west of the centre would be important for the region because it is possible that by the middle of the century a new major engineering project could be justified so building a bridge or tunnel link between Helsingør and Helsinborg in Sweden that would create a Hamburg-Copenhagen-Stockholm axis with the German and Swedish cities just 500 miles or 800 kilometres apart and with Copenhagen and Malmö at the centre point. The text of the new plan is set out as major bullet points simply because this is a document for the next stage of consultation but it is worth reading, even at this stage, because local citizens should see this as one way, at the very least, of understanding how their city could develop over the next decade and, of course, like the original Finger Plan, it will set the framework for life in the city and for the built environment of the city through to the middle of the century and probably for a much longer time frame. What the report does have, even in this version, is attractive and informative graphics for a series of maps that make the hard data and the stark proposals easier to see in terms of specific areas and their potential extent and their impact on the landscape. A planning initiative for the metropolitan area of Copenhagen was launched at the end of January and is based on the findings of a committee that has been working since last May. This is an initiative by the city to bolster the capital area including plans to create homes for 200,000 more citizens. There are plans to improve transport links - so this is for the immediate period after the opening of the new inner city ring of the metro and preparing for the next stages for inner city transport including more metro lines but also improving motorway links in anticipation of the completion of a new road and rail tunnel linking Denmark and Germany. The initiative also anticipates more work on flood risk from climate change and there are plans to bolster tourism with the potential for carefully-controlled expansion of the airport as a growing hub for a much wider region. These proposals have been set out as 52 points across those four headings and should be read along with the revised Finger Plan for 2019 that also covers the period through to 2030.
the full report can be read on line or downloaded as a pdf file.